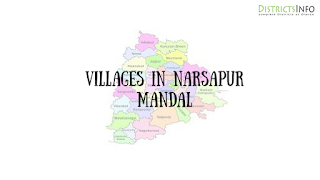 Narsapur Mandal with new villages in Medak district: Narsapur is a Mandal in Medak District of Telangana State. Narsapur Mandal Head Quarters is Narsapur town. 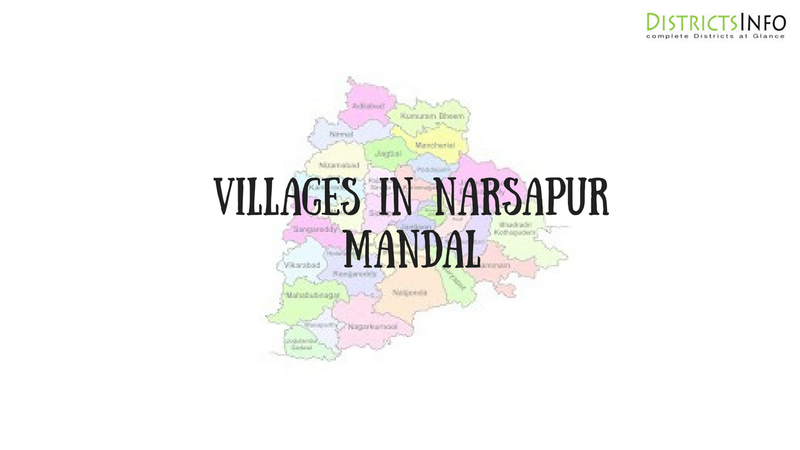 Narsapur belongs to Medak revenue division.Narsapur Mandal consists of 35 villages.we have listed here, Ahmednagar, Ibrahimbad, Admapur, Jakkupally, Chippalturthi, Nagulpally, Moosapet, Mohammadabad @ Janakampet, Manthoor, Reddipally, Khazipet, Tujalpur, Thirmalapur, Gollapally, Brahmanpally, Lingapur, Achampet, Hanmanthapur, Malparthy (DP), Narayanpur, Chinna Chintakunta, Pedda Chintakunta, Sitarampur, Rustumpet, Ramachandrapur, Tuljarampet, Awancha, Yellapur, Madapur, Narsapur, Kondapur, Kagazmaddur, Naimatullaguda, Nathinoipally, Dharmaram (DP).